Keeping track of all of the different schedules in your tutoring company can be difficult. TutorPanel helps with a scheduling system that makes it easy to keep track of all of your student and teacher schedules in one place. Also included are time-saving features that make maintaining schedules easy. Schedule student lessons for the next year or more in just seconds. Simply complete a simple form when adding a student and set lessons to repeat by day, week or month according to the schedule you set. It's as easy as that! 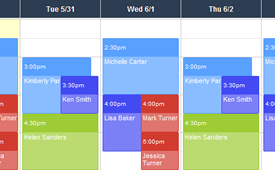 The TutorPanel calendar shows you all of the lessons and events in your company. View by month, week, day or teacher. Events are color-coded and viewing or editing events is as easy as clicking on an event and choosing an option. 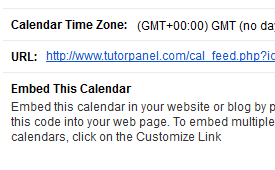 Because TutorPanel is web-based changes made on any users calendar are instantly visible on other calendars. Reduce no-shows with automatic lesson reminders sent by email to students and parents. TutorPanel lets you enable or disable lesson reminders for each student. 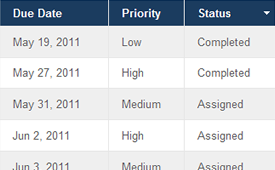 Plus you can control how far in advance the email is sent and customize the email template with your own message. You can easily assign and track tasks for your teachers or staff using TutorPanel, including a task description, due date and priority level. Employees can view their tasks in their TutorPanel accounts and update the status as in-progress or completed to let you know their progress. Parents love receiving regular updates on their child's progress and with TutorPanel this is easy! 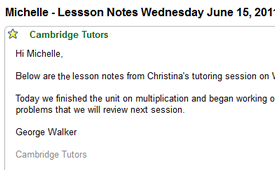 TutorPanel lets you automatically send lesson notes to parents or students by email. Plus you can easily customize your message or simply use a default template. TutorPanel lets you import your calendar feed to other calendar programs that support iCalendar feeds such as Google Calendar, Apple iCal, Microsoft Outlook, Yahoo Calendar and more. TutorPanel calendar feeds makes it more convenient for you and your tutors to quickly view their schedules from your calendar program of choice. 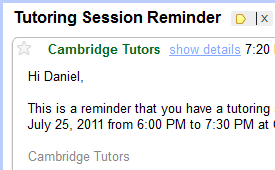 Schedule both one-on-one or group tutoring sessions. Lesson changes are visible instantly for all affected users. Filter calendar to view a single tutor or student. Give students, parents and tutors online access to their calendars. Edit, delete or reconcile events directly from the calendar. Color-code lessons by teacher for easy recognition. Adjust recurring lessons by day, time, and frequency.